I’ve been posting about restaurant experiences we’ve had in recent months, the series wouldn’t be complete without a road trip. Recently, I needed to travel to Madison, Wisconsin for a work-related reason, so of course, we made a fun weekend get-away out of it. 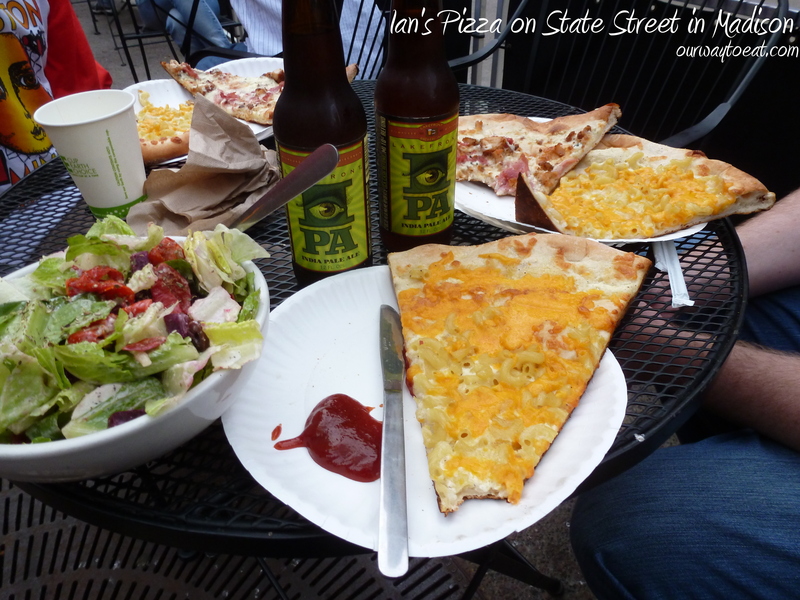 Our weekend in Madison began where our previous visits ended: at Ian’s Pizza on State Street, eating a huge slice of Mac & Cheese Pizza. Our previous visits to Madison took place when we were still students, extending our adolescence as far into our 20’s as possible. Our good friend Jenn brought us to a Badgers homecoming Football game in 2006. Yes, we wore red, and yes we did Jump Around. We experienced as much of the glory of a Big Ten homecoming as we could pack into a weekend; highlights included being in the crowd when the Badger’s football team won Paul Bunyan’s Axe from the rival Minnesota Golden Gophers, the sheer madness of State Street and an end to the evening that seemed totally appropriate — a slice of pizza topped with Mac & Cheese. A year later in August we stopped for the evening in Madison en route to Milwaukee to see the Brewers play the San Francisco Giants with Bjorn’s brother and our friend Mark. Again, our night ended with a stroll down State Street singing our best rendition of Anthems for a Seventeen Year Old Girl by Broken Social Scene and a legendary late-night slice of Ian’s Pizza. To be sure that we still have a finger on the pulse of what is hip in Madison, we began our recent visit to Madison by recruiting Bjorn’s cousin Patrick who is a second year student at UW to show us where to eat. We met him at the Student Union, and sure enough, he guided us down State Street to Ian’s Pizza. The big discovery I made this trip to Ian’s is what an amazing salad they can toss together. The salad is made-to-order and served perfectly dressed in a bowl with your choice of fresh vegetables and salad toppings, including cheese or meat. The thin slices of tender, milky, fresh mozzarella in my salad at Ian’s was some of the best I’ve tasted in recent memory. Bjorn and I enjoyed a bottle of Lake Front IPA, a hoppy brew from Milwaukee with our meal. It turns out a big slice of pizza covered in creamy white sauce, Macaroni noodles and melted cheddar cheese is still as good as it sounds, even in the early part of the evening. It seems that I missed out on how pretty Madison is in my earlier visits, probably because I was only out on the town at night. 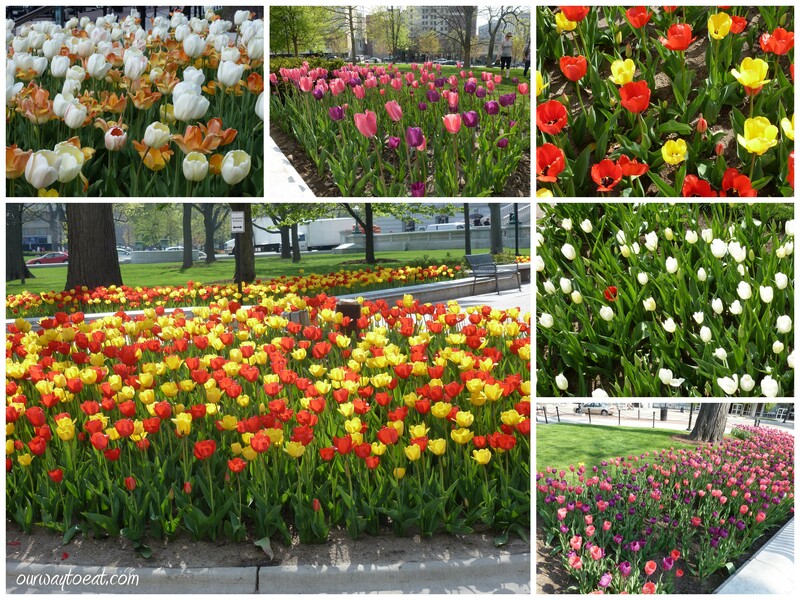 This trip I was amazed to see the gorgeous tulips and daffodils that were blooming all over the city. The tulips above are planted outside of the Capitol. Different colour combinations are planted outside of each wing. I have to imagine that the colour-combinations have a certain meaning, but I don’t know it. All I know is that Madison is a beautiful place to visit in the daytime. 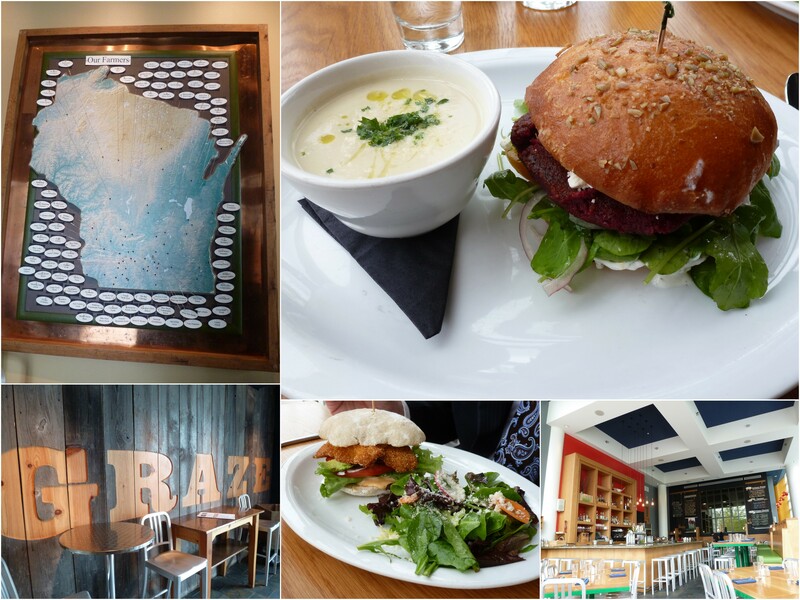 The next stand-out meal that we had in Madison was lunch at Graze, a farm-to-table restaurant right outside the Capitol in the heart of downtown Madison. We also have Patrick to thank for this recommendation. The restaurant’s name is a nod to the proprietor’s shared belief that animals should be fed grass and allowed to roam. A map of Wisconsin by the restaurant’s entrance points to the sources of the locally grown and produced fruit, vegetables, cheese, meat, fish and poultry used throughout the menu. The lunch menu contained a variety of salads, snacks and sandwiches. Bjorn ordered the Perch Sandwich, described as Great Lakes panko-breaded perch with avocado, tomato, onion, lettuce and chipotle aioli on ciabatta bread served with mixed greens, SarVecchio cheese and Champagne vinaigrette. I ordered the Beet and Walnut burger and a cup of pureed celery root soup. Having had very little experience with celery root I expected the soup to have some bitterness, something like a turnip. Instead, it was smooth with a pleasant, mild celery flavor. The Beet and Walnut “burger” patty was deep a magenta hue, and was soft, and moist without being crumbly and had a pleasant beetiness. It was topped with veggies that were tasty and noticeably fresh including cherry tomato, cucumber, red onion and arugula as well as feta cheese, lemon Greek yogurt and oregano vinaigrette, all piled generously on a pepita-topped eggy brioche bun. The feta, Greek yogurt and vinaigrette were a bright flavor contrast to the mellow beet, and a soft counter-point to the vegetable’s crunch. The Beet and Walnut burger was fabulous and I want another! I would love to see a Beet and Walnut burger replace the ubiquitous, tired and unexciting Garden Burger where it stands as the stalwart vegetarian option on menus at countless restaurants. It was simple, delicious and the options for topping it would be virtually endless. We have some wonderful farm-to-table restaurants in the Twin Cities, I only wish more of them were as casual, affordable and accessible as Graze. 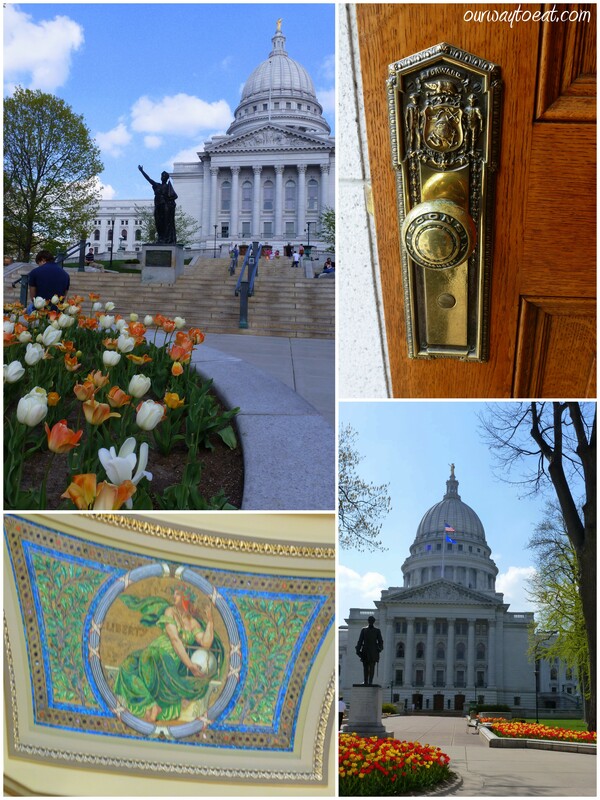 Every day in Madison we seemed to walk past and sometimes through the capitol building. We live in Minnesota’s capital city, and the contrast between the capitol building’s place in the capital cities of Minnesota and Wisconsin is hard to ignore. Saint Paul’s impressive capitol building faces up toward the residential Summit and Crocus Hill, and towers over downtown and the river bluff below. While it is focal point when you are downtown it is an island, removed by several blocks from any of the action of the city. In contrast, Wisconsin’s Capitol building is the heart of the city, and streets leading out from each wing in all directions are alive with museums, shops, businesses and hundreds of restaurants. The capitol grounds serve as a central park. There is constant pedestrian traffic, movement and activity at the Capitol in Madison; you feel the city’s lifeblood emanating from this central spot. In Minnesota’s defense, Bjorn tells me the inside of our capitol is actually more impressive in its art, marble and architecture than Wisconsin’s which I thought was quite nice and adequately opulent. I have never been inside our capitol. (oops). It seems that people who grow up here or in states nearby visit our capitol on a 5th Grade bus trip (even kids from Western North Dakota, like Bjorn) never again to return. For as many times as I’ve driven by our capitol, looked at it from the end of Summit Avenue and thought that it is breathtaking to have the beautiful Cathedral and capitol building standing in stately prominence in the middle of my very own city, in the 9 years I’ve lived here I have managed not to enter it, while I entered Wisconsin’s capitol building at least twice in 3 days. I should make a point to get inside one of these days. One of my favorite things about Wisconsin is its enthusiasm for beer and cheese. A cab driver recommended the Tipsy Cow for a mid-afternoon snack so we decided to check it out. We must have blended into the wall for at least ten minutes after being seated before anyone acknowledged us. We probably managed to catch the servers during the time that usually represents the afternoon lull. We shared cheese curds and sampled Hopalicious APA by Ale Asylum which was an easy-drinking hoppy beer that seemed to be the hottest tap in town. 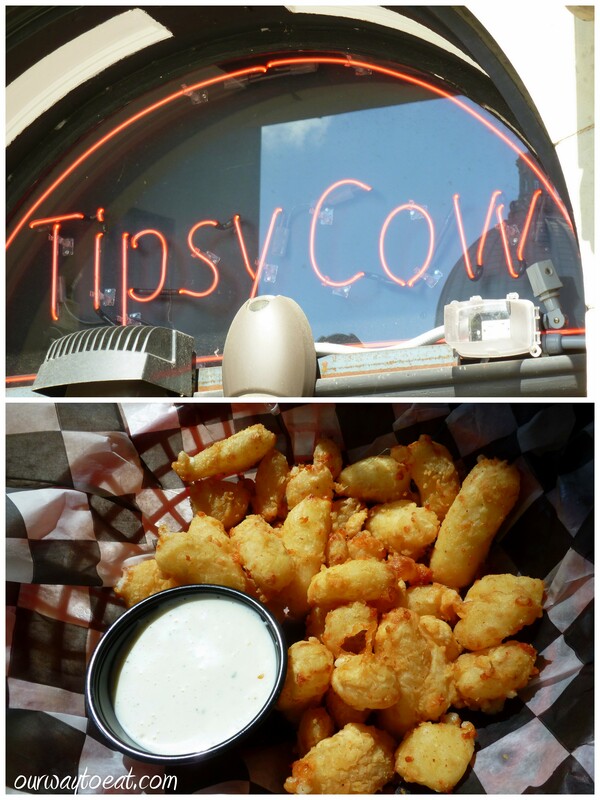 To be honest, the curds at the Tipsy Cow were only okay, certainly not the best that Wisconsin has to offer. We saw a lot of Madison on foot. 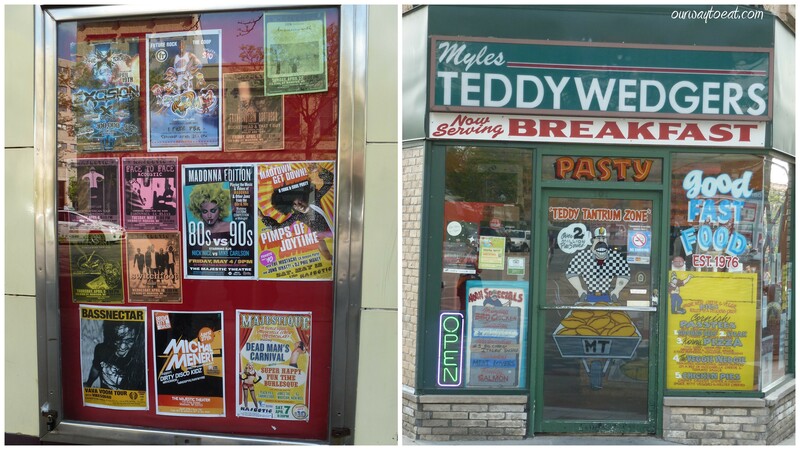 Here are some scenes from State Street. 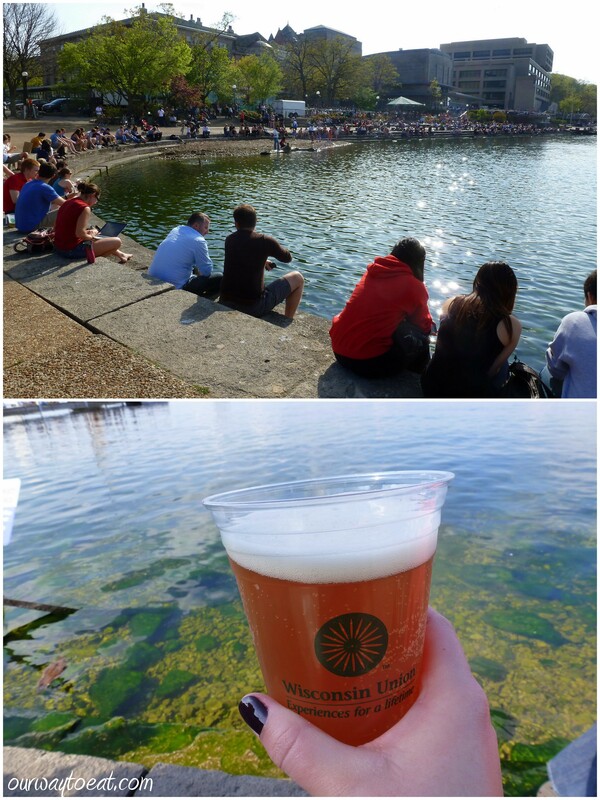 With UW and the crowds of students who are unmistakably present in Madison, we spent a lot of time reminiscing about our college days. I don’t think either of us would change a thing about our undergraduate experiences at state schools in smaller cities, but we could definitely see the appeal of being an undergraduate student here where the university dominates the town. The next surprising discovery we made in Madison was what a cool place the UW Student Union is to visit. It is a hang out for students and the entire community. You can sign up for a guest pass and gain the privilege of buying a pitcher Hopalicious beer to enjoy while seated on the waterfront. How has no one told me about this before? Every University of Wisconsin alum I know is fairly convinced of the superiority and awesomeness of their university experience, and I’m starting to understand why. Sitting on the lake in a crowd of people who are all out to relax and enjoy the spring sunshine was one of the highlights of our long weekend in Madtown. As much as Minnesota and Wisconsin have their rivalries, there is no denying that Madison is a vibrant city with a lot to offer a visitor or a college student. I highly recommend a road trip. This entry was posted in Dining Out, Farm to Table, Omnivore, Travel, Vegetarian and tagged Anthems for a Seventeen Year Old Girl, Badgers, Beet and Walnut Burger, Broken Social Scene, Cheesecurds, Cheesehead, Graze, Jump Around, Mac & Cheese Pizza, Madison, Paul Bunyan's Axe, road trip, Student Union, Tipsy Cow, UW, Wisconsin by Our Way to Eat. Bookmark the permalink.